The California Basic Educational Skills Test (CBEST test) is designed to assess if a prospective educator has the basic reading, mathematics and writing skills necessary for employment in the education field. The CBEST exam does not evaluate the teaching skills of an applicant, nor does it replace other subject matter knowledge, or the field experience required in the full licensing process. The California State Superintendent of Public Instruction works with the Commission on Teacher Credentialing (CTC) to develop and administer the CBEST. The CTC has contracted with The Evaluation Systems group of Pearson to assists in the development, administration, and scoring of the Basic Skills Test. The CBEST exam is under-estimated. A false sense of “over confidence” causes many test takers to under prepare. Unfortunately, this leads to an unnecessary high failure rate. 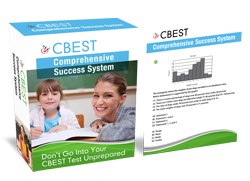 Get a CBEST test study guide with practice questions that cover the specific competencies listed at the official CTC website. Beware of free CBEST practice tests online. Most free practice questions or low cost books (and answer selections) are misleading. They don’t cover the actual exam content you face. The free or cheap CBEST test prep books usually don’t have practice questions that correctly represent the structure, format and wording of the real test. Register early as space is limited and offered on a first come, first serve basis. The CBEST test is available in either a computer or paper based format. The paper based exam automatically registers the candidate for all three topics: reading, mathematics and writing. The time permitted for this exam is four hours. The cost of the paper based test is $41. The computer based CBEST exam is more flexible as it is possible to register for a section individually or in combination and still have four hours to complete the exam. The test fee however is the same regardless of how many sections are selected and costs $102. Registration is available on the internet 24 hours a day, 7 days a week, while telephone registration is available 9:00 a.m. to 5:00 p.m. Monday to Friday Pacific time. In order to register for the test, an applicant must provide their social security number. For all paper based CBEST tests it is important to arrive by 7:30 a.m. For computer based test candidates should arrive 30 minutes prior to the start time. The test center will take a palm scan, photograph and electronic signature as part of the identity verification process. If you refuse, you will not be allowed to take the test, and you will not receive a refund. The CBEST consists of three sections: Reading, Mathematics, and Writing. The reading section has 50 multiple choice questions which evaluates an applicant’s ability to understand written passages, tables and graphs. All answers can be found within the text provided so no outside resources are needed. Approximately 40 percent of the questions evaluate critical analysis and evaluation skills and 60 percent test the applicant’s comprehension and research skills. The CBEST Mathematics section also has 50 multiple choice questions, the majority of which are word problems. This section contains three skill sets: (1) estimating, measurement and statistical principles, which represents approximately 30 percent of the questions, (2) computation and problem solving, which represent approximately 35 percent of the questions, and (3) numerical and graphical relationships, which also represents approximately 35 percent of the questions. The writing section of the CBEST exam has 2 essay topics. The first topic assesses the applicants writing skill by analyzing a given situation or statement; the second essay requires the candidate to write about a personal experience. It is necessary to complete both essay questions. Make sure the CBEST study guide pdf, paper book or other preparation materials you use provides a comprehensive review of the academic skills measured. It must also give you an ample amount of realistic test practice to sharpen critical test taking skills. Therefore, be sure your book has at least one full-length practice test. Unofficial CBEST testing results will be available for the reading and mathematics sections for those who choose computer based testing at the conclusion of the test. The official results will be available for both the computer and paper based exams on the score report dates. Raw CBEST scores are scaled and range from 20 to 80. In order to pass the exam applicants must receive a minimum score of 41 in each category. There is a little flexibility in the scoring as it is possible to pass with a 37 in one or two of the sections provided the combination of the three scores is 123 or higher. It is possible to retake the CBEST exam as often as needed but there is a waiting period of 45 days required between attempts. The more candidates invest in practice exams and CBEST study the less likely it will be necessary to retake this evaluation for California educators. Go to: How Much Would CBEST Prep Failure Really Cost You?